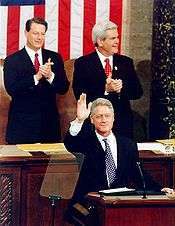 The 1997 State of the Union address was given by President Bill Clinton to a joint session of the 105th United States Congress on February 4, 1997. 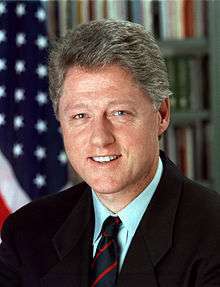 The speech was the first State of the Union address of President Clinton's second term. ↑ Richard E. Sincere, Jr. (February 1997). "O.J., J.C., and Bill: Reflections on the State of the Union". Metro Herald. Archived from the original on 2002-07-31. Retrieved 2007-01-23. Watts told his audience -- about 100 high school students from the CloseUp Foundation watched in person, while a smaller number watched on television at home -- that he is "old enough to remember the Jim Crow" laws that affected him and his family while he grew up in a black neighborhood in small-town Oklahoma. 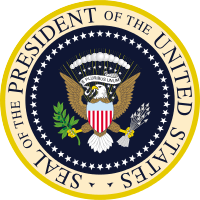 ↑ Office of the Clerk, U.S. House of Representatives. "Office of the Clerk". Archived from the original on 2009-05-11. Retrieved 2009-04-14.